Derry City and Strabane District Council have launched a consultation process to allow interested parties to have an input in shaping the region’s arts and culture strategy for the next five years. A Co-Design group of local representatives from a range of arts and culture disciplines has already been formed to assist Council officers and strategic partners on the development of the strategy. 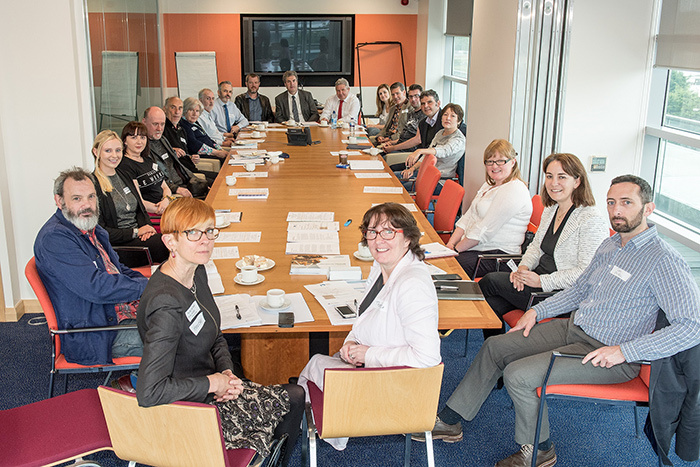 The group held its first meeting at the Ulster Bank offices in the City last week and will now host a series of workshops from Monday June 26th until Wednesday June 28th. The sessions are inviting individual artists, practitioners, organisations and venues to give their input for the strategy for 2017-2022 that will be finalised in September. John Kerr, Arts and Culture Manager with Derry City and Strabane District Council, encouraged anyone with an interest in arts and culture in the city to take ownership of the process by attending the workshops. “This is an ideal opportunity for anyone working or with an interest in our local arts and culture sector to tell us their vision and help shape a strong and ambitious strategy for the years ahead,” he said. “The informed contribution we receive at these workshops is essential if we are to design a strategy that allows us to fully realise our arts and culture potential and compliments our wider Community Plan for the Council area. “The strategy aims to build upon the legacy of the 2013 UK City of Culture Year by encouraging a culture of collaboration and articulating a clear direction of travel for a strong and ambitious arts and culture sector within the North West. The Co-Design group is chaired by Verbal Arts Chief Executive James Kerr who said he was looking forward to the process of working with Council and other interested parties on how best to take the City and District’s Arts and Culture strategy forward. “The establishment of a Co-Design group by Derry City & Strabane District Council to develop an Arts & Culture strategy that supports and contributes to the wider Community plan is an exciting new initiative,” he said. “The main legacy of the City of Culture in 2013 was a general recognition that Arts & Culture can and will play a significant role in the social and economic life of the City & District. “This open, accessible Co-Design process is a fantastic opportunity for everyone who has an interest in arts and culture to contribute to the next stage of local development. The full list of workshop dates, times and venues is available online at http://www.derrystrabane.com/Services/Arts-and-Culture. Sessions will include the following sectors: Participatory/Community Arts including Circus Carnival and Street Arts, Individual Artists and Practitioners, Music, Visual Arts, Crafts and Cinematic Arts, Literature, Community Festivals, Tier Two Festivals and Events, Arts and Cultural Venues (Various), Drama, Performing Arts and Dance, Heritage and Museums. Anyone wishing to get involved are asked to confirm their attendance indicating which workshop they will be attending by e mailing jean.smyth@derrystrabane.com.